A few decades ago the discount brokerage services gold rush began when the American government relaxed regulations against fixed brokerage commissions. Among the wave of up-and-comers to offer price-sensitive traders better commission rates were Scottrade and E*TRADE. Scottrade is now owned by TD Ameritrade, a division of TD Bank, and offers all of its brokerage services via Ameritrade while E*TRADE (commonly referred to as E*Trade or E-trade) remains an independent, publicly traded company. In this article, we’ll focus exclusively on the brokerage services provided by Scottrade as a division of TD Ameritrade. It should be noted that Ameritrade and Scottrade are now the same company and the two names can be used interchangeably, although it is likely that Ameritrade will phase out the Scottrade brand in the future. Both remain among the top trading platforms in the industry, offering consumers a wide range of investment options. Both companies allow you to set stock alerts, perform ladder trading, screen stocks, and manage ETFs, mutual funds, options, and bonds. No matter which you choose, you’ll be able to view live quotes and streaming financial TV. As expected from two top trading platforms, they each offer a desktop software app for Windows and Mac, and full-service websites. And they both provide a full range of mobile apps on Android and Apple as well as an Apple Watch app. Each platform features comprehensive educational tools, including live seminars and online quizzes. Both companies offer a wide variety of charts, including historical trades, but Scottrade has more options. It’s when it comes to extra services that Scottrade and E*TRADE really differ, however. E*TRADE offers far fewer options than Scottrade. Ameritrade has 364 brick-and-mortar locations while E*TRADE has just 30. Both offer checking accounts and debit cards, but only Scottrade offers credit cards. Scottrade is also FDIC-insured while E*TRADE is not. TD Ameritrade excels when it comes to educational tools via its thinkorswim platform, including some 500 monthly webinars compared to E*TRADE’s paltry 10. But only Ameritrade lets you buy and sell foreign currencies (forex). Scottrade offers virtual trading while E*TRADE does not. E*TRADE will let you set a watch list of 112 entities while Scottrade lets you watch up to 514 entities. One particularly nice feature only offered by Scottrade is heat mapping. 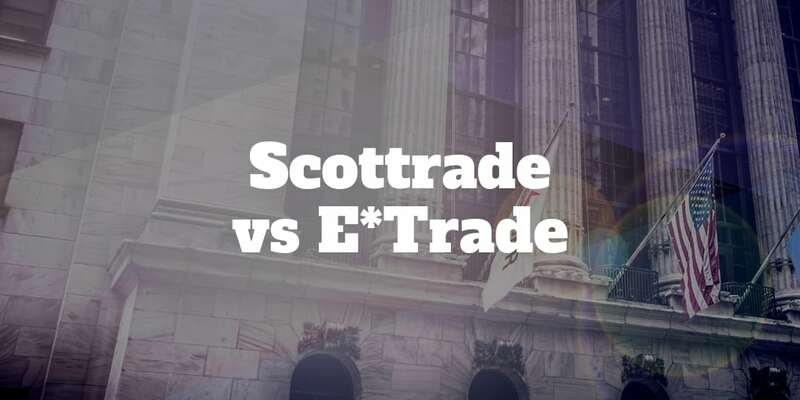 Overall, the pricing structure for both E*TRADE and Scottrade is very similar, but E*TRADE is slightly cheaper and is even more affordable if you plan on executing more than 30 trades per quarter. All bonds and CMOs (except for treasuries at auction) and CDs (both new issue and secondary) are charged on a net yield fee basis. UITs (both new issue and secondary) are charged a placement fee. Both companies are full-service online trading platforms with mobile apps, desktop apps, and even an Apple Watch app. That being said, E*TRADE’s mobile apps seem to be a little easier and more intuitive to use. For the “meat and potatoes” of online brokerage activities, such as trading stocks, options, bonds, and mutual funds, both companies have a full range of tools, including comprehensive educational and charting tools. TD Ameritrade leads the industry with its thinkorswim platform – it is about as close as you can get to a professional-grade trading platform, and features extensive education in financial markets and trading techniques. This includes virtual trading (called paperMoney) and deep histories on stocks and options as well as the ability to set up complex trading strategies. Both companies offer similar investment options: stocks, options, futures, ETFs, mutual funds, and bonds. Ameritrade, however, offers more complex features like multi-legged options, a bond wizard, and access to both fixed and variable annuities. Ameritrade also offers forex trading, which E*TRADE does not. Both companies are comparable when it comes to mutual funds. Ameritrade offers access to more than 13,000 mutual funds, including no-load, load, and no-transaction-fee funds. E*TRADE boasts that it offers access to over 9,000 mutual funds, including over 4,400 no-load, no-transaction-fee mutual funds. Both companies offer access to commission-free ETFs. E*TRADE boasts having over 250 commission-free ETFs as well as the ability to execute 24×5 trades on a select list of ETFs. Ameritrade, on the other hand, claims access to over 300 commission-free ETFs as well as 24×5 trading. The two trading platforms feature the ability to trade ETFs and offer reports, rating information, and top-10 lists for ETFs. Ameritrade’s thinkorswim platform wins with slightly more research and educational tools on ETFs. Virtually nothing separates E*TRADE and Scottrade when it comes to options, including the price ($0.75 per contract). The only significant difference is that E*TRADE lowers its fee to just $0.50 per options contract for users executing 30 or more trades per quarter. Both companies allow you to execute stock trades for $6.95 per trade as long as you do it unassisted and via their online platforms. E*TRADE lowers the price to $4.95 if you execute 30 or more trades per quarter. Scottrade offers access to over 40,000 bonds and securities and allows you to set bond alerts. It also has a software program called Bond Wizard that enables you to set up a bond ladder or use a preset bond ladder. E*TRADE offers very similar options and prices, although it does provide a few more educational tools, including video explainers and third-party research reports. E*TRADE does not offer forex to its customers. TD Ameritrade allows you to access its forex trading platform for free, and its thinkorswim toolkit provides a great deal of information on currencies, including historical data. All of Ameritrade’s mobile apps (except for Apple Watch) allow you to execute forex orders. E*TRADE requires a $500 minimum investment to open an account. Scottrade has no minimum deposit requirements. However, Scottrade has an electronic funding minimum of $50. If you want to execute options or margin activities with Scottrade, you will first need to have an account balance of at least $2,000, and you’re restricted to a 30% minimum equity requirement. Both companies provide extensive educational tools to assist with tax strategies. They also offer referrals to independent, third-party tax experts to assist with your tax strategies. Scottrade offers customer service in both English and Spanish via a toll-free number that is staffed 24 hours a day, seven days a week. There’s also a toll-free number that provides TTY services for the hearing impaired. Help via SMS message, Facebook Messenger, and Apple Messages is also available. There are over 360 branches located across the country for your convenience. You can reach them via fax and by standard mail as well. E*TRADE offers telephone customer service during business hours Monday through Friday via a toll-free number. E*TRADE can be reached at one of its 30 local branches across the United States. A proprietary live chat feature is available through its website and apps. Both companies offer full-service apps on Apple mobile devices (iPhone/iPad), Android mobile devices (phones or tablets), and the Apple Watch. E*TRADE, however, seems to have invested more in the design of its mobile apps as it offers a cleaner, more intuitive feel. TD Ameritrade’s thinkorswim platform, though, is richer in educational and research tools. Investors who are confident about their education level and who want a clean, fast interface to execute common brokerage actions on a regular basis should choose E*TRADE. E*TRADE offers discounts on fees for active accounts (30+ trades per quarter), and its overall fee structure is slightly lower than Scottrade’s. That being said, Scottrade should not be counted out. Scottrade offers more account options, more types of accounts, and a far broader range of investment options, including forex. 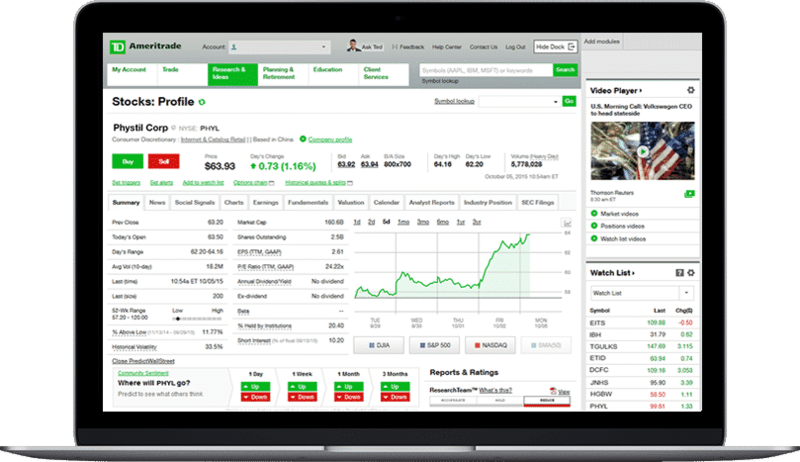 TD Ameritrade’s thinkorswim educational platform is professional-grade but accessible to beginners too, and offers virtual trading capabilities, which E*TRADE does not. If you want fast, sleek, and simple, go with E*TRADE. If you prefer to take your time and set up more complex investment strategies, go with Scottrade. Frankly, both platforms are very powerful and can equally serve the needs of an investor. E*TRADE is slightly more cost-effective for the most common activities like trading stocks, but Scottrade has a lot more depth when it comes to research, analytical tools, and complex execution options. E*TRADE is probably best suited to investors who are very confident in their investment strategies and want to execute a higher volume of trades quickly and efficiently at a lower cost. Scottrade, however, is better for either beginning investors who want to chat with someone in person and spend time performing research or expert investors who want to execute more complex and diversified investment strategies. Scottrade was originally founded in 1980 in Scottsdale, Arizona, and was first known as Scottsdale Securities. After initially thriving as an in-person brokerage with brick-and-mortar offices, the company launched its very first website in 1996 through which it was able to offer online trading options for the first time. By the year 2000, nearly all of its business was being conducted online, although the company still maintains over 300 brick-and-mortar locations. The company was renamed to Scottrade in 2000 when the domain name Scottrade.com became available. After suffering for two years following the “dot com bust,” Scottrade began opening new retail branches. In 2008, Scottrade formed a subsidiary named Scottrade Bank to offer retail banking services. In 2017, the brokerage services division was bought by TD Ameritrade, and the Scottrade Bank was separately purchased by TD Bank. Today, the company is based in St. Louis, Missouri, and has an estimated annual revenue of $1.1 billion. E*TRADE was founded in 1982 in Palo Alto, California, just a short distance from the campus of Stanford University. E*TRADE was one of the first discount brokerage companies to offer online trading. It saw its profits soar after it became available for customers of America Online (AOL) and CompuServe. In 1996, E*TRADE became a public company after launching an IPO on the stock exchange. In 2001, E*TRADE purchased the competing firm Web Street Securities, which allowed it to offer its customers the ability to trade online directly via a website. In 2004, the Toronto-Dominion Bank unsuccessfully sought to acquire E*TRADE. Instead, the bank acquired Ameritrade and merged it with its TD Waterhouse discount brokerage division to create a new company called TD Ameritrade, which later purchased Scottrade in 2017. Today, E*TRADE remains an independent company with an annual revenue of approximately $2.3 billion.